Daimax requires a G Persona Blast, and needs a Dimensional Robo heart. Then, he gains 10k power, and then if you have 2 face-up G Units in the G-Zone, he gains +1 Critical. Four, and your Dimensional Robo front-row rear-guards also gain 5k and a Critical. An excellent way to bully opponents on 3 damage, as a Checked Critical trigger will force quite a lot of guard, or at the very least get a G Guardian or Perfect Guard out of the way. Or both. Or at least that's the idea. He's still sort of slow given his need for a whopping FOUR G-Units. Yes, Daiearth nets you two if you Stride it first, and a G-Guardian will take care of the third, but that assumes you even have a G-Guardian to use at all. He's also only specifically useful if you go second and therefore can Stride first. Otherwise more often than not damage will be high enough to force a Daikaiser Leon (I'm assuming you're playing the only D-Robo deck that matters). He's good for bullying people who healed excessively and has relevance Late Game if you run out of Leons somehow, but otherwise he's a bit slow. Hilarious with Operator Girl, Rinka though. Ok, that's the end of the review, folks. 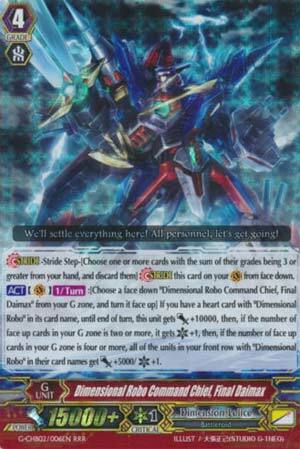 ...Oprah jokes aside, this card's a different pace for D-Robo players. Usually y'all throw caution to the wind, getting wins off of clutch Grade 3 drive checks and guard-breaking, with your probabilities getting better with the addition of Daibazooka. Now, this guy aims to be the ultimate pressure: every lane is a kill lane. Striding once into him is okay...he becomes a big beatstick. That isn't the hype. Save at least two copies so you can Stride into Daimax once the opponent is at 4-5 damage. They're gonna have to drop guard for every attack. If you've managed to eat your way through the opponent's hand in previous turns, the 5k and crits to the whole front row get even scarier. (Final Daimax will be swinging for 3 damage. PG or die.) Daimax isn't as slow as he seems, even though he does need to have at least 4 G-units face up for the crits to the front row. You're gonna G-Guard on average at least once, and all the Strides D-Robos care to go into are persona flippers. Not hard at all. Daimax is a great addition to D-Robos, and an alternate win condition for those rare times D-Robo players don't want their checks to decide their wins. Justice, people. It's among us once more. And it freaking hurts.